Sandy and I reside in a small town tucked against the east slopes of the Cascade Mountains of Washington State. Our snowy home is about as remotely located from the soft coral sands, aqua waters, intense sun, and cooling breezes of the Bahamas as one can be in the lower 48 states and yet, in the short space of 6 weeks we hope to be cruising those exotic waters. Our vessel will not be a touristy cruise ship, with its hordes of fellow passengers and rigid itinerary. Nor will we be aboard a chartered sailboat, as the cost of chartering imposes unacceptable limits to the length of time we could afford to spend on the water. 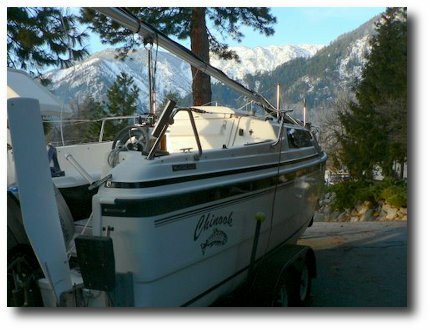 Our dream cruise will last 2 ½ months, and we will sojourn aboard our trailerable sailboat, Chinook. We decided to take up sailing rather late in life, with the purchase of our MacGregor 26X power sailor in 2002. Macs, as they are affectionately referred to by their many owners, are most frequently known as “those sailboats with big outboards which motor really fast.” Owners of more traditional sailboats often look down their noses at Macs as lightly built boats with poor sailing characteristics. 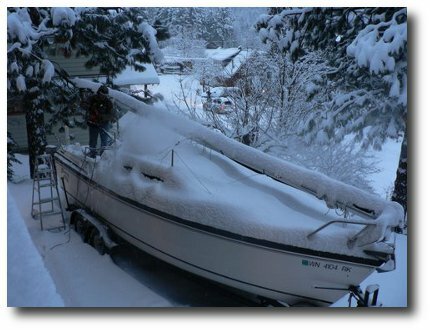 Most Mac owners, however, simply love their boats for their low purchase cost and versatility. 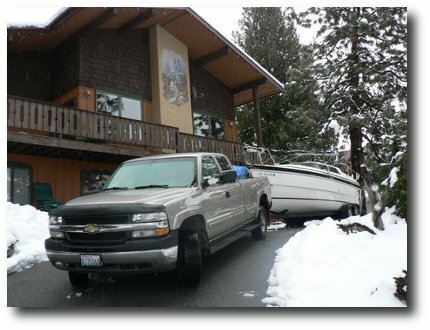 Being trailerable, the Mac can be “moored” in your driveway when not in use. With its large outboard engine (typically 50 to 70 hp), the Mac can indeed plane at speeds of 15 to 20 mph or more. It can serve as a day sailor or carry a small family on overnight outings. 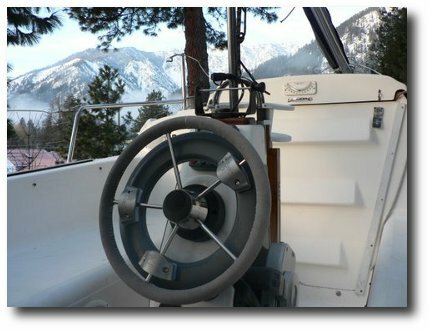 Mac owners love to modify their boats to suit their personal boating interests. From the outset, we wanted to explore as many different places as possible in our Mac. This would take the form of extended cruising, and thus, we focused on maximizing fuel, water, electrical and storage capacity. Being newcomers to sailing, we read books, hung out at boat shows, and took classes, but most importantly spent time on the water, always with the focus on extending horizons, both in terms of our expertise and the boat’s capability. We spent our first boating season gaining experience on Puget Sound and various Eastern Washington inland waters. Our second season would coincide with retirement, and the unique opportunity to embark on a year long circumnavigation of the US. Hitting the road in early July 2003 in a pickup and camper, with Chinook in tow, we spent the next year as vagabonds, following the seasons and experiencing scenic and historic highlights. About one third of our time was on board Chinook, cruising such waters as Jackson Lake in the Tetons, Yellowstone Lake, Isle Royale on Lake Superior, Lake Champlain, the coast of Maine, the Intracoastal Waterway from Virginia to Florida, the Everglades and Florida Keys, the northern (Abacos) Bahamas, and Lake Powell. Subsequent sailing seasons have led us to such varied places as the majestic Inside Passage to Alaska, remote lakes in coastal British Columbia, the classic sailing waters of Chesapeake Bay, and the starkly beautiful Sea of Cortez. When out on one of these cruises, conversations with fellow sailors from much larger boats will frequently turn to questions about our MacGregor. Being somewhat familiar with the speedy reputation of the MacGregor, they frequently ask, “How fast will she go?” I invariably raise eyebrows with, “She cruises nicely at 60…” and then add “while on the trailer, of course.” And that is the feature of our Mac which appeals to us most. Our “home waters” are only limited by the existence of a decent road and boat ramp, and once we’ve launched we’re free to partake of the cruising lifestyle while exploring enticingly new waters. The idea for this cruise dates back to our initial visit to the Bahamas in early spring, 2004. We had actually intended on heading for the Exumas, but a salty dockmaster at a St. Augustine marina suggested we focus on the Abacos for our first Bahamas cruise. Not so far out, fewer major crossings, yet still outstanding cruising waters. We followed his advice and found him right on all counts. We had a memorable time, but whenever our thoughts returned to the Bahamas we recalled a comment we’d heard more than once. “If you think Abaco waters are clear, they’re nothing when compared with the Exumas.” We just had to return to the Bahamas. And this time, we’d make it all the way out to the Exumas. If the idea for a cruise is the seed, it will never bear fruit unless thought is given to best time to plant, optimum location, how to nourish. Planning for a major cruise often begins a full year before the actual trip. I thoroughly enjoy this process. It enables me to begin the cruise in my mind many months before the actual departure. We evaluate the boat, truck and trailer and consider which components and systems need maintenance, repair, upgrades or replacement. 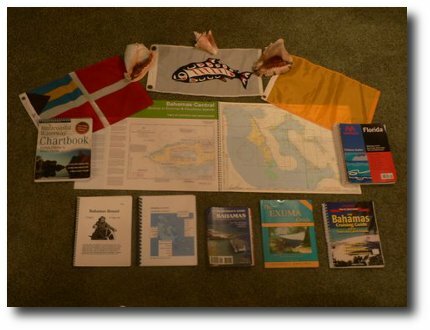 Cruising guides and chartbooks are selected and ordered, electronic charts are loaded into the laptop, various cruising routes are evaluated, and the start date and length of trip must be estimated. We favor spring as the most attractive season for cruising the Exumas. Possible dates are bookended by weather. Try to leave too early and we’re tempting late winter blizzard conditions on the cross country drive. Also, we know from experience that east coast northers do make their way out to the Bahamas in February and March, thus complicating Gulf Stream crossings and resulting in getting pinned down during extended norther blows. On the other end, hurricane season officially begins June 1. Heat and bugs also become more of a bother as summer sets in, so we plan on crossing back to Florida no later than the end of May. Water temperatures should be hitting the mid 70’s by late March and April. A final consideration, minor in comparison with weather factors, is the closing date for lobster season in the Bahamas, which happens to be March 31. I’d love to spend at least a few days in snorkel gear, pole spear in hand, hunting for these delicacies. This thought process results in the following planned itinerary: begin the drive east on March 2; allow 9 days for the cross country drive, with several sightseeing stops along the way; arrive at our son’s home in Lexington Park MD on March 10 for an extended weekend visit and some long overdue grand-parenting time; pull out for Florida on March 15 (2 day drive); hook up with friends in Ft. Pierce FL, where we’ll do last minute provisioning and boat prep work; launch the boat on March 19 for a 3 day shakedown cruise down the Intracoastal Waterway, bound for No Name Harbor at the south end of Key Biscayne; allowing a couple of days for last minute provisioning/prep as well as weather delay if it’s blowing out of the north, we hope to make our Gulf Stream crossing to Bimini sometime around March 24; cross the Great Bahamas Banks to Chub Cay in the Berry Islands with a hoped for arrival of March 28 or thereabouts; exploring the Berries for a week, with lobster hunting on the agenda for our first few days there; cross over to Nassau somewhere around April 5 for several days of layover-sightseeing-provisioning; depart for the Exumas around April 8, allowing over 2 weeks to work our way down to the cruising center of Georgetown; spend several days in the Georgetown area before heading up to Eleuthra, possibly via Long Island and Cat Island; spend a layover week at Hatchet Bay on Eleuthra around mid May, so we can participate in a mission project with Bahamas Methodist Habitat at James Cistern; depart Eleuthra around the start of the third week in May for a week long cruise back to West End on Grand Bahama Island where we’ll pick our weather window for a crossing back to Florida (probable destination will be St. Lucie Inlet); short run back to Ft. Pierce and our awaiting truck and boat trailer, with a target date of May 27; pull and clean the boat, with about 10 days allowed for the drive home, making a few stops along the way to break up the trip; expected arrival home about June 7. Of course, it goes without saying that all of the above is subject to change due to unforeseen circumstances such as mechanical breakdown during road trips, trouble with the boat, extended weather delays, health problems, or simply arriving somewhere we can’t bear to leave. The itinerary is fairly detailed and specific for a couple of reasons. First, I like to work these things out ahead of time, so I can properly pace the trip and try to allow adequate time for places of particular interest. It gives us a useful frame of reference when we’re going to be out for so long. Also, I just enjoy planning out such things. We’re able to imagine ourselves in various exotic places long before we actually pull out of the driveway. The house is an utter disaster. We have boat gear and trip related projects scattered and strewn about the whole house. Hardly a room is spared. Sandy is running a 3 ring circus in the kitchen, fixing up large quantities of granola and several varieties of sweetened and spiced peanut and almond snacks. Stacks of foodstuffs, the result of her first few trips to the grocery store, are stacked on the counters, pending their transfer to the guest bedroom which presently serves as our provision organizing and packing room. The dining room table is covered with her sewing projects: lightweight pull on pants made of solar-guard fabric, a Sunbrella cloth pocket organizer for the head, and a cover bag for my big landing net (so the netting won’t snag on anything in the king berth when she grabs for it while I’m battling the Big One). I have gear spread out all over the living room. Maps, charts, books and travel guides are stacked in the back corner. The cockpit cushions line the entry hallway (why I’m not quite sure, except that I haven’t figured a better place to put them just yet). Assorted gear bags are stacked below the TV in the family room, ready to be hauled out and packed in the boat. Clothing duffels and miscellaneous cruising stuff lie in piles in the front bedroom. My shop has yet to be cleaned up following completion of the latest boat projects, which include installation of the new auto pilot and fitting Dri-Dek tiles into the vee-berth. The garage sports several stacks of boat gear which have been pulled down from shelves but not yet organized for loading into the boat. It’s gotten to the point we need to call time-out and organize things a bit. Lately, we’ve been spending way too much time asking each other where the heck the scissors or the West Marine catalog or the hardware for the fishing reel ended up. And what about the boat, good old Chinook? I look out onto the driveway where she normally sits, and the parking pad is disturbingly vacant. I know the reason why, of course, and it’s both reasonable and necessary. Last week I towed her across the mountains to Blue Water Yachts, to get some last minute work done on the trailer and outboard. I hadn’t relished taking the winter cover off this time of year, but it had to be done. As far as the drive was concerned, the first 30 yards were toughest. We got freezing rain the night before I left, so boat and truck were both encased with ice on Friday morning. Our parking pad is at the head of a steep driveway (16 percent slope), and it too was a solid sheet of ice. I scattered snow melt crystals up and down the driveway, and once it was secure enough to walk on, I slowly eased her down to the street. Roads were good heading over to Seattle. Now I’m just hoping for good conditions next week when I drive over to retrieve her. I’ve already mentioned a couple of boat improvement projects. Early in the planning stages I was forced to make a serious strategic decision. Should I bite the bullet and spend 7 boat bucks or so on re-powering, or attempt the trip with our Nissan 50 hp TLDI. We got the Nissan new with the boat in 2002, and she now has around 800 hours on her. I’ve maintained her well and she’s performed reliably throughout most of her service. We’ve had a couple of problems along the way, but nothing too serious. I’d like the peace of mind which should accompany cruising with a new engine, but budget considerations suggested this just wasn’t the time. I opted instead to upgrade a wide range of systems and equipment. I opted to go with an inflatable instead of the 10 ft. Porta-bote which has faithfully served as our dinghy up until now. I selected a 9 foot, high pressure floor inflatable which is lighter overall, less bulky to store, and more easily hauled out of the water when we prepare for major crossings. I replaced our 9 year old Garmin GPS/Sounder, since the sounder part no longer worked. We got a new laptop to run our electronic charts. The old laptop was also about 9 years old and had become quite “quirky”. I ordered and installed a Raytheon Smart Pilot X-5 wheel pilot model. Considering the number of major crossings and passages this cruise will entail, I’m really eager to give it a try. I’ve rigged up a stern anchor, complete with nylon rode and chain and a storage bag which mounts on the stern railing. This will free me from going up to the bow and grabbing the spare Fortress Guardian anchor and rode, and toting it back to the stern when we need to set a stern anchor. I’ve installed panels of Hyper-vent material between the foam and the underside of the cockpit seat cushion covers, to help keep the seat cushions dry. The new tiles of plastic Dri-Dek, which I’ve fitted into the vee-berth area should also help in that department. Most recently, we’ve purchased a large Breeze Booster wind scoop for the forward hatch, which will provide improved ventilation in the cabin when we’re basking or baking in those sunny Bahama anchorages. This last thought is particularly appealing as I look outside at our dreary winter landscape. I retrieved the boat from Blue Water Yachts this past Saturday. Driving conditions were good, and with an extensive series of Pacific storms rolling in all this week, I’m grateful that Todd got his work done quickly enough to allow me to beat the weather with my road trip. The brake repair job went well. Todd found both the master cylinder and backup solenoid needing replacement. He bled the brake lines, and assures me that the brakes now are fully functional. Regarding the outboard, he had intended on replacing the high speed fuel filter. However, one of the bolts which must be removed proved stubborn, and rather than risk shearing it he opted to leave the old filter in place. He looked things over and test ran the engine. Everything checks out fine. Let’s hope the old Nissan is up to the task ahead. When I climb aboard to work on last minute projects or stow gear, I pat her on the cowling and make positive, appreciative comments. We’ve now completed most of the items on our preliminary checklists. These are major projects, mods, and service items. The major projects are now done. It’s time to put together a more detailed preparation list. Clean boat interior, clean truck, get truck oil changed, figure out stowage plan, cancel the paper, drop insurance level on the car, drop garbage service, arrange mail forwarding, pay property taxes, find someone to water houseplants, and dozens of other tasks. We try to think of everything, but can’t help wondering what we’ll forget. On our Alaska cruise it was the charging cords for the laptop computer. Headed for the Sea of Cortez, I left the big fish landing net and gaff behind. This time I’ve already got this stuff in the gear pile. What will it be this time? I’m working on ways to better organize gear on board. I’ve installed several long tubes in overhead locations on both sides of the king berth area. One is made of 4 inch PVC drain pipe. I used plastic rain gutter downspout pipe to make 3 others. They work out great, and will be very useful in storing things like our hatch vent wind scoop, beach umbrella, hand bilge pump, and similarly shaped gear which is usually heaped on the king berth floor. These items will be much handier to grab when stowed in their overhead tubes. In 5 more days I’ll begin monitoring the 10 day extended weather forecasts for places along our driving route. I know that we’re likely to encounter below freezing temperatures, at least during the first half of the trip. With the Wallas stove heater doing its job we’ll be able to camp comfortably enough in the boat, but it occurs to me that if temperatures in the mid 20’s or lower are forecast, we’ll have problems with liquids freezing. I wonder if we dare stock up on provisions like beer, pop, and juice before setting out. I think I’ll test some items out here at home to see how quickly they freeze when left out in the truck overnight. We’ve managed to establish contact with Abe McIntyre of Bahamas Methodist Habitat, and plans for our Eleuthra mission project are beginning to take shape. We are hopeful that this element of the trip works out. We look forward to meeting folks on Eleuthra and becoming involved in the housing improvement work being done there. At this time, one week from today, we’ll be on the road. We got another couple inches of snow this morning, and I had to go out and blow it off with the leaf blower once again. This routine is getting old fast. The temperature is forecast to drop to near zero here on Friday, with half a foot or more of snow on the way. Weather like this really makes us yearn to be headed for warmer places. We’re in pretty good shape with preparing and stowing. I’ve got all my boat projects completed, and have tested systems and sorted through all the miscellaneous spare parts and repair kits. The boat cabin is freshly cleaned, and I’ve begun stowing gear into lockers, drawers, and the king berth area. 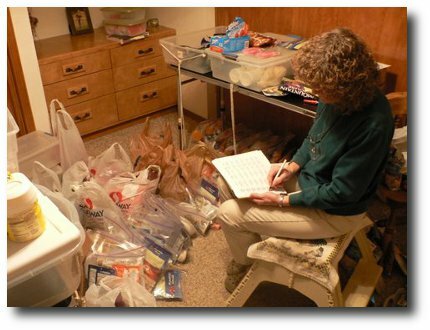 Sandy has done a terrific job with the provisioning, and is now assembling food into our plastic storage tubs. She’s put together the ingredients, with pre-measured quantities, for various specific meals. Complete meals are separately bagged and stowed in plastic tubs. The tubs are inventoried, labeled, and logged on her menu sheet. This system should minimize having to dive into the back of the king berth, in search of a missing ingredient that we’ve just run out of. With so much food stowed on board, it’s critical to be able to access things with a minimum of hassle. Crawling around in the back of a congested king berth when its 88 degrees outside is the last place I want to be spending time. Sandy has been testing out recipes for things we can bake in our Outback Oven. This reflective oven sits on top of a single burner propane camp stove. She baked up a pizza with a new crust recipe for last night’s dinner. It came out great, so we’ll be bringing pizza crust fixings along. This evening she tried out a scratch bran muffin recipe, and they were outstanding. She’s prepackaging packets of muffin mix, so we’ll be able to enjoy muffins around once a week. Tomorrow she’s going to experiment with foccacia bread. If successful, it will provide a good source of sandwich bread when our loaf bread runs out. My checklist is down to details such as canceling the paper, reducing insurance on the car which will be parked for the next 3 months, arranging to forward mail, canceling garbage service, and temporarily discontinuing TV service. Tomorrow I’ll clean the truck and have the oil changed, and then I can start packing things in the back seat area. Provisioning is now complete, except for last minute shopping for perishables such as bread, fruit, salad fixings and meats. Sandy has completed organizing and packing the food tubs. 8 large tubs to be stowed in the king berth, and 3 smaller tubs (our “working tubs”) which go in the forward settee storage area. It’s pretty amazing that you can assemble provisions for 3 months in such a compact stack. 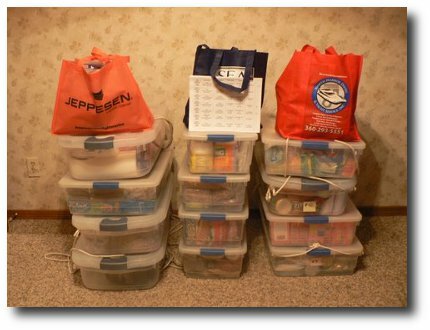 In addition, food for the road trip and meals for the first 12 cruising days are in marine tote bags, so we shouldn’t have to dig into the large tubs until after we reach Chub Cay. I don’t plan on inflating the dinghy until then, and the dinghy is stowed in front of the stacks of large tubs. I want to avoid lugging it around the cabin if at all possible. Packing the boat and truck is being seriously complicated by our weather. Following the snow of the last couple days, it’s turned unseasonably cold here, single digit cold. I’ve pulled the truck into the garage so I can thaw it out and pack in relative comfort. It’s a very tight fit. I want to have everything possible packed ahead of time. Strategizing how to pack, travel and camp in sub-freezing temperatures is proving to be a challenge. Some food items in the tubs might freeze, and if they do I’m unsure whether they will leak. Also, we’ve bought our pop, beer and wine. From unhappy experience I know that pop and beer cans rupture when frozen (I forgot to completely empty the pop rack in the bilge last fall), so I’ve packed the beverages in the truck cab. I’m hoping the truck will retain enough heat when parked overnight to avoid a hard freeze of drink cans. The first few days will be most critical, with night time lows forecast to be in the low twenties in most places where we’ll be staying. It’s been snowing all day. 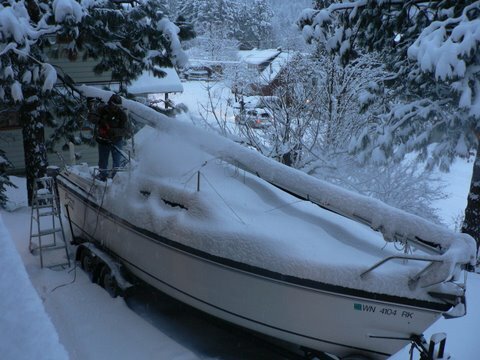 The routine of shoveling a path out to the boat, then blowing the snow out of the cockpit and off the cabin roof every time I want to stow more gear, has definitely progressed well beyond the novelty stage. At church this morning, during announcements, I made a brief power point presentation to the congregation describing our cruise plans, with emphasis on our planned volunteer mission week on Eleuthra Island. The church gave us $300 to present to Bahamas Methodist Habitat on behalf of Leavenworth Community United Methodist Church when we arrive there. This afternoon I drove to Wenatchee for some last minute shopping while Sandy parked herself in front of the sewing machine to fabricate a new mosquito net cover for the forward hatch. The cover we already have won’t work when we set up the new forward hatch ventilation scoop, so we’re making one which will install from inside the cabin and which can be used with the scoop in place. Of course, creating a prototype design such as this requires frequent trips to the boat to check fit. With snow piling up at a rate of 6 inches per hour, I shovel the path and blow off the snow for each trip. Forecast is for 8 inches tonight and tomorrow, and more on the way Tuesday. It seems that winter is trying its best to hold us in her grasp. However, we’re determined to pull out Wednesday morning. I’ll be thinking of Florida palm trees and rum cokes all the while I’m shoveling the driveway. This weather is just nuts. We’ve lived here for 25 years, and this is easily the coldest, snowiest end of February/beginning of March we’ve ever experienced. When I got up yesterday morning I was greeted with over a foot of new snow. 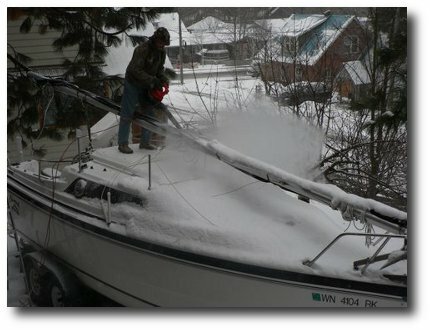 Time and energy which I needed to expend on final preparations was spent cleaning the boat off, again, and shoveling driveways (we have two). And, it continued snowing throughout the day, with half a foot of additional heavy, wet snow accumulating. It finally quit by late afternoon, but the forecast didn’t look good. Sure enough, this morning it’s started to snow again, and 6 to 8 inches is forecast for today and tonight, with more predicted tomorrow. I’ll have major work just getting the boat down my 16 percent slope driveway tomorrow morning. Wintry weather is not just a problem here at home. It’s totally disrupting our road trip plans. I’d intended on taking a northern route, via I-90 as far as Sheridan, Wyoming. This involves crossing the panhandle of Idaho, over 4th of July Summit and Lookout Pass. I checked the road report for these two passes last night, and was seeing serious travel warnings and “chains required” notes for vehicles with tows. Further, an arctic outbreak is bringing severe low temperatures to the northern plains. I definitely want to avoid having to chain up, so my preferred route, which included a sightseeing stop in the Black Hills, is no longer being considered. Instead, we’ll swing south, taking I-84 through Boise and pick up I-84 just north of Salt Lake City. We’ll stick with I-84 as far as Lincoln NE, and then pick up our planned route east. We drove this route 2 years ago and wanted to go a different way this trip, but the current weather pattern is forcing our hand. Today, I’ll have to drag out the AAA camping directories and try to locate campgrounds which are open year round. Most campgrounds don’t open until later in the spring. I like having specific destinations targeted when towing the boat cross country, and I don’t appreciate surprises such as “campground closed” signs. Meanwhile, today I’ll keep the driveway cleared off, finish last minute preparations, and finalize route planning. The old saying goes, “Everyone talks about the weather, but no one ever does anything about it”. Well, tomorrow morning I plan on doing something about it. Namely, getting out of here and searching for some place warmer. 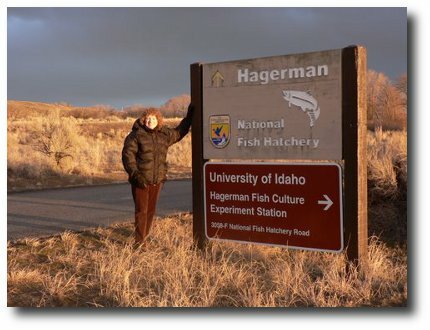 We’re parked on the grounds of the Hagerman National Fish Hatchery, which is located in the Thousand Springs region of the Snake River in southern Idaho. We’re visiting with Eric, a long time family friend, who works here at the hatchery. It was a long day’s drive, but we made it in good shape, arriving at 5:15pm. This is a great place to stay the night. 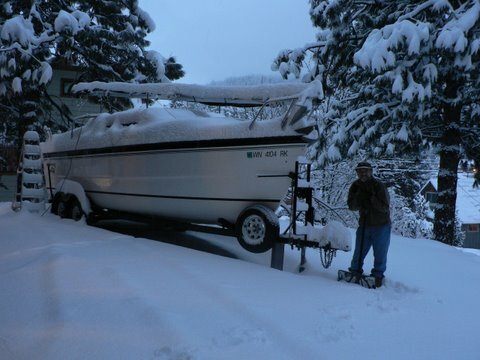 In addition to catching up with Eric, we’re able to plug in and heat the boat cabin with our portable electric heater. It took an early start to make it here that soon, especially considering we lost an hour to the time zone change along the way. I’d planned on getting up at 5:30 am this morning, but was awake at 5:10 am, eager to get going. 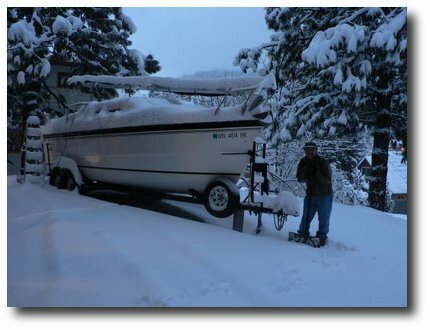 I was greeted with 3 inches of heavy wet snow which had to be pushed off the driveway before I dared try rolling the truck and boat down to the street. The chock blocks were frozen in place, so I whacked them loose with a lug wrench, and at 6:45 am we were actually on our way. We encountered slush on the roadway for the first 30 miles, but after that the roads were clear. We crossed the Columbia River into Oregon just south of Richland WA, and picked up I-84 near Umatilla OR. This highway follows the old Oregon Trail route through northeastern Oregon and southern Idaho. It’s remarkable to consider that in just one hour we travel about as far as an emigrant’s covered wagon could go in a week. Mileage was rather poor (11.7 mpg for the first tank and 12.9 for the second), due both to some steep grades on this first leg of the trip, as well as to the surprising headwinds we encountered. I was driving a bit faster than usual, which also didn’t help. I am hoping to average 13 to 14 on the flatter terrain, and holding the truck down to around 60 mph should do the trick. We’ve just returned from a delightful evening walk along the hatchery entrance road. This place is a true wildlife haven, with hundreds of ducks and geese winging their way overhead, and taking flight off the spring creek which flows through the grounds. We were favored with a beautiful sunset while on our walk. The low sun angle brought out vivid highlights in the trees and brush, and illumined a brief but intense rainbow just before setting. We’re moored in the Rock Springs KOA for the night. Based on info from the AAA camping guide, this may be the only open campground along the entire length of I-80 this time of year. We’re the only ones here, so it’s not hard to understand why. When I went into the office to register, the lady asked what type of camping vehicle we were staying in. I replied “sailboat”. She didn’t believe me, and I had to persuade her to look out the window. I guess they don’t get many MacGregors checking in around here. It’s in the low 20’s outside, and the wind has really kicked up. If I didn’t know better, I’d think we were at anchor in some harbor, from the way the boat is bouncing around in the wind. If it blows any harder outside, I may be tempted to set my anchor. We’ve got an electric heater as well as the Wallas heater going, and the temp in the cabin is up to 70 degrees. It will get into the teens outside, and we’ll run the electric heater all night, so we should stay nice and cozy. We took our time getting started this morning, and weren’t on the road until 9:30. It rained most of last night, and was still raining when we hit I-84. Rain turned to snow as we angled southeast toward the Utah border. It snowed hard for a while, but wasn’t sticking to the roadway. We stayed with I-84 down to Ogden UT and then eastward through the canyon to the junction with I-80 in occasionally rainy conditions. We stopped at a rest area a few miles shy of Evanston WY, and I talked with a trucker who said he’d heard that the eastbound interstate was closed about 20 miles east of the rest area. He’d gotten the report on his CB radio from a westbound trucker. The sun was poking out at that point, and I couldn’t imagine a closure due to weather problems. Perhaps an accident, I thought. We pushed on, and made it to Evanston just fine. Lots of fresh snow in the area, but none on the road. A few miles east of Evanston, however, we crested a hill and saw traffic starting to slow and back up. It was moving however, and we were able to continue on. 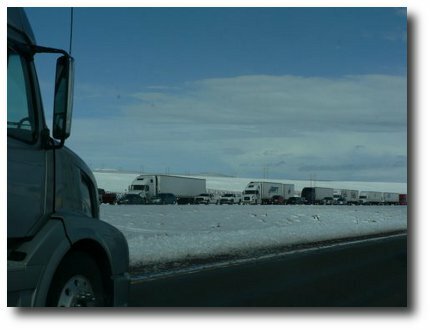 The semis were bumper to bumper ahead, but all moving. I noticed plows clearing slush off the westbound lanes and a couple of miles further on, saw traffic on the other side of the freeway completely stopped. They must have shut the westerly lanes down while the plows worked. The instantaneous traffic jam was incredible. We cruised past at least 15 miles of vehicles, 90 percent big rigs, completely stopped. Some of the truckers had their hoods tipped up, checking oil or whatever. We must have come along just after the eastbound traffic got moving. I’m sure glad we didn’t get caught up in the mess we were seeing on our left. We got in to the KOA around 4 pm, and went to go for a walk up into the foothills. It felt great to stretch the legs, and I had just enough time after getting back to barbque some steaks at the picnic table. We’ll try to get started a little earlier tomorrow morning, since we plan on driving about 100 miles further than today. Hopefully, it won’t be quite so cold down along the South Platte River in Nebraska, where we intend to camp next.